Several years ago, we demonstrated that medroxyprogesterone acetate (MPA)- induced mammary adenocarcinomas in female BALB/c mice with an incidence close to 80% and a mean latency of around 13 months (1). These tumors were mostly ductal, progestin-dependent (PD) adenocarcinomas with high levels of estrogen and progesterone receptors (ER and PR) (2). 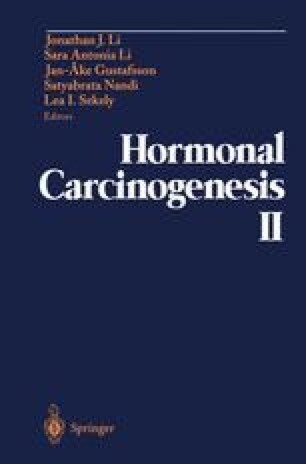 We later found that progesterone (P) also induced mammary carcinomas, but this time the tumors were mostly lobular, progestin-independent (PI) adenocarcinomas with lower levels of ER and PR (3). There was a constant correlation between progestin dependence and morphology, that is, lobular carcinomas were always PI and ductal carcinomas PD (3). To extend this study further, we designed a model of co-carcinogenesis using medroxyprogesterone (MPA) with N-methyl N-nitrosourea (MNU) in BALB/c mice. We obtained a high incidence of mammary adenocarcinomas similar to the hormone-induced lobular tumors, and showed that MPA can act as a potent promoter.